her family live) October 2011. One of this blog's authors wrote the op ed below. It was published yesterday on the Forward.com website and will appear in the Forward weekly print edition, datelined 9th December 2011. 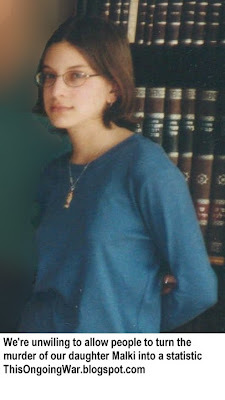 Why Did Netanyahu Free My Daughter's Killer? Published November 30, 2011, Forward issue of December 09, 2011. 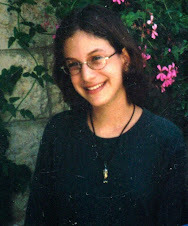 Malki, in October you would have turned 25, if only… if only you hadn’t stopped in at the Sbarro restaurant in the center of Jerusalem with your best friend, Michal, that hot summer afternoon of August 9, 2001. You were on your way to a camp counselors’ meeting but had some time to spare. At 2 p.m., while you both stood on line, waiting to order, a Palestinian Arab man finished his meal, stood up and detonated the explosives concealed in his guitar case. Fifteen men, women and children perished. In recent weeks, the pain we have endured for 10 years has become even more intense. We can thank Prime Minister Benjamin Netanyahu for that. 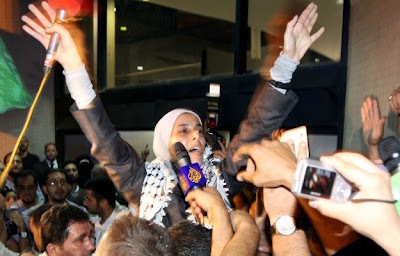 Despite our hand-delivered entreaties to keep your murderer, Ahlam Tamimi, in prison — to which Netanyahu never responded — he freed her in the prisoner exchange deal that led to the release of Gilad Shalit. The letter of “explanation” he claimed publicly in October to have mailed to all the affected terror victim families has, for some reason, not yet reached us. Adding salt to our wounds is an avalanche of revelations about the Shalit saga, which was unleashed the moment Gilad returned home. When Maariv journalist Ben Caspit spoke to Yitzhak Mordechai, a former defense minister and operating commander of the southern, central and northern commands, Mordechai told him that it was only when the worsening condition of Palestinian prisoners held in Israel became an issue in Gaza that Hamas was willing to negotiate. Caspit then asked a question that haunts us, Malki. Referring to the astonishingly indulgent treatment that had been accorded to terrorists in the Israeli prison system, he wondered what would have happened if the authorities hadn’t waited so long to take away the perks that turned these prisoners’ incarceration into the equivalent of summer camp. “Too bad no one thought to explore this option in real time,” Caspit said. It is nothing less than suicidal to place our trust in a leader who has sacrificed his nation’s security and its judicial system for political gain. Malki, please know that we have not given up the fight. We will seek an investigation into the disastrous handling of the Shalit affair. We still hope for an apology from our prime minister for his role in this travesty of justice. We will not rest until her dreams are dashed and she is back in prison. We will pursue that goal not to seek revenge or to ease our relentless longing for you, but simply because it is the only just and sane thing for a democratic state to do. Frimet Roth is a freelance writer based in Jerusalem. After her daughter’s murder, in 2001, she and her husband founded the Malki Foundation, which provides support for Israeli families of all faiths who care for a special needs child.